After all this tech talk about the Blogging Photography and Google Analytics, I felt a teeny-tiny bit creative and inspired this morning (being super exhausted from my travels and already from the day ahead). After eating a lollipop, realising I could use the lollipop’s stick as dotting too (it was one of those moments where you have that light bulb light up above your head kind of thing haha). 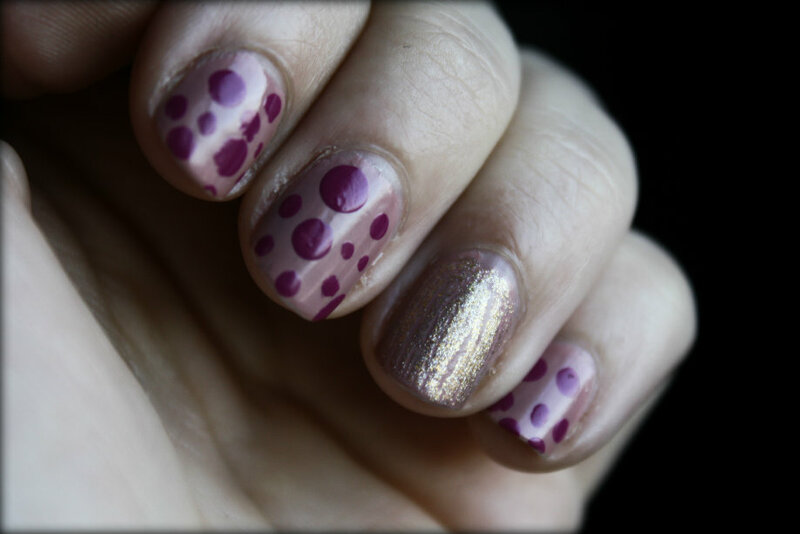 I had already applied the Misscellaneous polish by Missguided (*) as base, so I grabbed the next best pink-ish nail polish (in this case Manhattan‘s limited edition 56L) and started dotting my nails for the very first time! But I didn’t want all of my nails just to be dotted, so I grabbed the very pretty upcoming new MUA crackle glitter polish in Gold (*)onto my ring fingers with a very thin layer, just so that it crackles a little bit to let the colour from the Missguided polish shine through. I really like the result! I’m hoping I’ll feel more inspired in the days to come! Do you play around with nail polishes? Do you use any alternatives to lollipop sticks as dotting tools? Apalerntpy this is what the esteemed Willis was talkin’ ’bout. Comme j'ai lu (et adorÃ©) D'acier, j'ai bien sÃ»r repÃ©rÃ© cette sortie, mais il est vraiment trop petit, je l'emprunterai.Dis-moi, toi qui frÃ©quente le club Dialogues, j'y suis inscrite aussi, mais la liste ne change jamais en ce moment, pas de nouveautÃ©s, c'est bizarre non ? Ou alors il y a une autre liste ?